Credit and Debit Danger at the Pump! 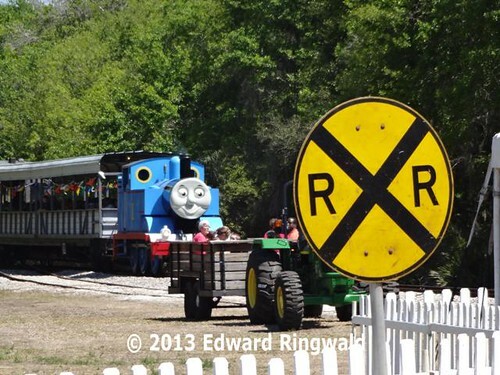 Being a proud member of the Florida Railroad Museum since January 2013 (and not to mention the complimentary train rides on regular ride weekends and the opportunity to volunteer for the annual Day Out With Thomas event over two weekends in March), I have noticed that there is no crossing protection on the route the museum takes between Parrish and Willow. Specifically, there is no crossing protection other than a crossbuck and a stop sign on Dickey Road in northern Manatee County, which is halfway between Parrish and Willow. In fact, the SW Line does not have any crossing protection, save for two crossings that are on the CSX owned portion of the SW Line in Palmetto adjacent to the junction with the AZA Line (CSX's main line from Tampa to Bradenton) south of 10th Street. Past 10th Street and going northeast on the SW Line the only crossing protection for the SW Line - both CSX and Florida Power and Light owned portions - is overpasses at US 41 and Interstate 75 as well as crossbucks and stop signs on the level crossings similar to Dickey Road. 1. Remember, anytime is train time. A railroad can put a train on that railroad track at any time, day or night. If you think on the lines of "oh, they don't run trains at this hour of the night on this track", you are wrong. Seriously wrong. 2. When you see the circular advance railroad warning sign - a circle shape sign with the X and the letters RR in black on a yellow background (see the two examples below) - this is the time to begin slowing down for the railroad crossing which is just ahead, not the time for being on your cell phone or texting. In fact, you should put down that cell phone while you are behind the wheel in the very first place; that phone call or business transaction can wait until you have arrived at your destination safely. 3. Most railroad crossings come with automatic signal flashers and gates. But beware: A substantial number of railroad crossings consist of a simple crossbuck and stop sign, such as the one on Dickey Road in northern Manatee County as pictured below. 4. If you are approaching the railroad crossing and the lights and gates start and the bell sounds, STOP! Be sure to stop at the stop bar well before the gate, especially if you are the first car to stop at the crossing. 5. If you are approaching a crossbuck only railroad crossing and you see the headlights of an approaching train, STOP! Looks can be deceiving; a train which you may think is far away is in fact just around the corner. Be sure to stop well behind the marked stop bar or sign. 6. Be mindful of vehicles which must stop at all railroad crossings regardless of whether a train is coming or not: School buses and tanker trucks carrying hazardous materials are a few of the vehicles that must stop at all railroad crossings. Now what do you do if in the event your vehicle breaks down on a railroad crossing? The first thing you do is to get yourself and your passengers out of the car immediately and well away from the tracks. This is for your safety regardless of whether a train is coming or not. If your vehicle stalls on a CSX owned track, immediately contact CSX Emergency at 1 (800) 232-0144. Be prepared to tell the CSX operator the crossing ID number and the milepost location. If you cannot find a sign posted on the crossing, immediately call 911 and let the 911 operator know what happened. Be prepared to give the 911 operator your location. 1. Get everyone out of the vehicle FAST!!! 2. Move everyone away from the track in the opposite direction of the approaching train. This will minimize any injury from flying debris as the train hits the vehicle. 3. A vehicle - and its items such as CD's, a laptop computer, etc. can be replaced. That's why you got auto insurance. A human life cannot. For you students out there riding the school bus to and from school, there is one very important safety rule you must know when it comes to railroad crossing safety: When your bus approaches the railroad crossing, the bus driver must come to a complete stop and open the front bus door to listen for trains. At the same time, the bus driver will turn on the dome lights to let you know that you must observe absolute silence while at the railroad crossing. So, remember the cardinal rule when you approach any railroad crossing: Stop, look and listen! It might sound like an inconvenience to you, especially if you are in a hurry to get home to watch the latest and greatest episode of American Idol, but that few minutes delayed could well save your life. And besides, you won't be breaking news on Bay News 9, 10 News (WTSP-TV), ABC Action News (WFTS-TV), NewsChannel 8 (WFLA-TV) or the Fox 13 Eyewitness News (WTVT-TV) regarding a railroad crossing accident. Finally, here's a great site that is dedicated to railroad crossing safety you may want to take a look at: Operation Lifesaver. After all, Operation Lifesaver is dedicated to all aspects of safety around railroad tracks, not just grade crossings. Not too long ago I reported about how TransUnion makes your credit report a public record, despite federal laws to the contrary that mandate that your credit report be kept private. Well, I just read more proof of how TransUnion will do anything to destroy your future well being as far as your financial affairs are concerned besides making your credit report public record. That proof is a recent article in the St. Petersburg Times by staff writer Drew Harwell about a New Port Richey resident, George Albright, who experienced tremendous difficulty trying to get a mortgage, two years after having to do a short sale to get out of an underwater mortgage situation. Why all this difficulty? It all boils down to how a short sale is reported to the credit bureaus. In George Albright's situation, according to the article, the short sale was being reported on Mr. Albright's credit report as a foreclosure, even though no foreclosure took place. In other words, the mortgage lender reports to the credit bureaus that a short sale took place and the balance was settled, but somehow the credit bureaus are probably taking it on themselves to report a short sale as a foreclosure. A foreclosure may sound bad on a credit report. However, a bankruptcy is the worst: It is akin to a nuclear attack on your credit report. Foreclosures stay on your credit report for 7 years, while bankruptcies stay on your credit report for 10 years. And I think TransUnion - who is known for its credit related scoring products such as their insurance score and employment score products - is doing everything to make sure that good people who have had to do a short sale of their home or have had late payments due to a change of circumstances (such as job layoff, for example) experience tremendous difficulties applying for a job, getting affordable automobile insurance or even getting a mortgage after waiting a few years. In other words, TransUnion will do everything to deliberately destroy your financial future. Besides, we work in order to pay our debts. After all, paying your debts is a moral obligation. Unfortunately, when one loses his or her job through no fault of their own (such as in a job layoff), how are the debts going to be paid? For instance, ask the employees of Universal Health Care Group, a downtown St. Petersburg health insurance firm recently shuttered by the State of Florida Department of Financial Services which resulted in job layoffs - I imagine what Universal Health Care Group's employees are going through, now that they are out of work. Going back to the St. Petersburg Times article, in 2011 TransUnion issued a report called Life after Foreclosure and Hidden Opportunities, in which "life event defaulters who missed loan payments during the recession are otherwise good credit risks". However, Transunion's spokesman, Clifton O'Neal, mentioned that "short sales are, in fact, indicative of future elevated credit risk." Mr. Clifton O'Neal, are you happy that TransUnion is in the business of systematically destroying people's futures? Do you like tarnishing the credit reports of people that had to do a short sale of their home as a foreclosure when in fact a foreclosure did not take place? And do you like making people's credit reports public record contrary to federal law that prohibits the practice, thanks to the Fair Credit Reporting Act? 1. First and foremost, hire a competent attorney who knows real estate issues, especially foreclosure defense. You need to have an attorney to guide you through the legal labyrinth when it comes to short sales and foreclosures. Should you be served with a summons for foreclosure on your home, hire an attorney very fast!!! Foreclosure is more serious than a short sale. 2. Be careful of mortgage lenders that ask you for a statement of financial affairs during the short sale process. That information can be used against you to pursue a deficiency judgment against you after the short sale takes place. 3. Policies vary from lender to lender when it comes to getting a mortgage after you have been through a short sale. In this regard, you may want to employ the services of a mortgage broker to assist you. 4. There is hope for you, even after a short sale or a foreclosure. Again, the services of a mortgage broker are valuable in this regard. 5. Consider including a statement in your credit report detailing what happened with the short sale. The statement cannot be more than 150 words and you can mail that statement to all three credit bureaus along with a cover letter requesting that your statement be included in your credit file. Whenever you write to the credit bureaus, always be sure that you send your letter Certified Mail with Return Receipt Requested - NEVER ordinary First Class Mail. This proves that someone at the credit bureau received your letter. Same thing goes for correspondence to your mortgage lender. As for the credit bureaus such as TransUnion, mortgage settlements that are the result of a short sale should be recorded properly and not recorded otherwise. It's like a physician who writes the final diagnosis on your chart just before you leave the hospital for having that emergency appendectomy done that instead of your diagnosis being appendicitis, it is a damaging psychiatric diagnosis of schizophrenia. Don't these physician diagnostic statements somehow make it to your file at the Medical Information Bureau? TransUnion needs to stop systematically destroying the financial futures of Americans who have had to do a short sale due to their home value being underwater. TransUnion needs to stop destroying the financial futures of Americans, period: That includes misreporting items on a credit report to making a credit report a public record. It's a nice weekend afternoon, and you’re out there on Interstate 275 going for a weekend drive. Somehow you take a glance at your fuel tank and that needle is slowly gliding towards ¼ of a tank. You spy a reputable gas station at the next exit, so you exit Interstate 275 and drive on in to the gas station. OK. You pull up to the pump on the side where you can insert the nozzle into your tank. Out goes your credit card, plug it into the pump reader, pump your gas and be on your way. Whoa! Before you plug that credit or debit card into that gas pump reader, you may want to continue reading this blog entry of the dangers you face when you use your credit or debit card at the pump. The first danger of using your credit card at the pump reader is the authorization hold. This is a set dollar amount that is preauthorized onto your credit card, which is released to an amount equal to your purchase when the gas station uploads their credit card transactions at a certain time of day. Unfortunately, this type of activity is legal. Most gas stations place a hold of around $75 – more than likely higher than that – the moment you plug that credit card into the reader. You pump your gas and you only get $15. What happens is that the $75 hold is deducted from your available credit until the gas station manager uploads the day’s credit card transactions to their bank. For those of you that have extremely small credit limits on your credit cards, those authorization holds can seriously deplete your available credit despite the fact that you did not spend that money. The end result is that when you go to make a purchase on your credit card that has that small credit limit, the card comes back declined. You got that right, declined. The second danger of using your credit card at the reader is that if you are using your debit card. Debit cards – when used with your PIN number – withdraw the amount of your purchase immediately. The major difference is that unlike a credit card where it accesses your credit line, a debit card accesses your checking account. Most reputable gas stations allow you to use your debit card at the pump. After you insert your debit card you are asked for your PIN. A small authorization hold of usually $1 is placed just to be sure that your debit card is valid, unlike the large authorization holds when you use your credit card. Now I have heard a lot of horror stories about the use of your debit card at the pump. One major horror story is when the gas station claims that debit cards are accepted at the pump, only to find out that your debit card is run through as a credit card purchase resulting in a large $75 or more authorization hold. What does this mean for you? A large authorization hold for a small purchase means that a good chunk of your available checking account balance is frozen until it is released when the gas station uploads the day’s transactions to their bank. Translation: Your checking account is thrown into an overdrawn status, even though you only spent a small amount for gas. Unfortunately, there are gas stations and convenience stores that want to deceive you out of your money by imposing those unreasonable authorization holds. Their owners and store managers don’t care about you – all they care about is making more money in order to fatten their bottom line. A third danger of using your credit card at the pump is the high danger of identity theft. Unscrupulous individuals out there place a device onto the pump reader called a skimmer; it is for the purpose of collecting credit card numbers from unsuspecting people and using them. So, what can you do to minimize your risk when you pay for gasoline? First, and foremost, steer clear of gas station "pay at the pump" readers. Go inside and tell the attendant how much you need (you can estimate if you would like) and hand the card to the attendant like you would do with a traditional credit or debit card transaction. After your purchase is processed, you can pump what you need. If you pump less than what you prepaid for, the attendant will give you a final receipt showing how much you actually paid. Unlike the pump reader mega-holds, the excess amount will fall off your account much quicker. For example, let's say you estimate that your car will take $20 worth of gas. You go inside and the attendant sets the pump up for a $20 prepaid amount for you. You pump the gas, and your car only takes $15. As such, you return inside and the attendant will give you a receipt for the $15 you spent; the unused prepaid balance of $5 is released to your account much quicker. Second, if time is a factor and you have to use a pump reader, at least use your credit card rather than a debit card. Just take your credit limit and your available credit into consideration. Third, if you use the pump reader, if the card reader slot doesn't look right or if it's wobbly in any way, do not use the pump reader - instead, go inside and pay the attendant on duty. The saying is this: If it doesn't look right don't do it. Fourth, if you encounter a rude or otherwise discourteous attendant (including convenience store clerks) and the attendant wants you to use the pay at the pump reader, take your business elsewhere. It is a sign that the convenience store does not care about customer service. It is your credit and/or debit card, and you have every right to protect that card from fraudulent use. After all, it's your money. Don't let these dishonest convenience store associates deny you access to your hard earned money with their ultra-high authorization holds when you pay at the pump.